The mantram of the astrologer is: AS ABOVE, SO BELOW. This is my prayer, my incantation; as I serve to translate the divine urging of this sacred juncture that is set before us. A miraculous time for the healing heart is upon us. We are imbued with full spectrum light as the Moon in her radiance emanates the visionary centaur consciousness of Sagittarius. Emotional revelation awaits us. It is time to en-lighten our worldly load with mindful understanding of ourselves and each other as we envision and embrace the next chapter of our emotional lives. Living from the center of our own hearts, our own life’s colorful palette of wonder and experience vividly expands into whole hearted engagement with each other and the world at large. The disengaged heart is a lonely heart. It takes courage to feel; really feel. The universe holds all that we will ever need. The expanded energies of this lunation gives us the opportunity to tap into our inner emotional resources so that we may line our lives with soft nourishment. Broken hearts are open hearts. 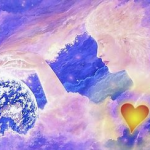 After the heartache of recent months, we are now engulfed by universal love that also speaks to the personal realms of our lives. This lunation offers us the ability to flow with our emotions in a manner which serves the expansion of our emotional bodies. Emotional truth is quiet. It allows us to wrap our own arms around our precious selves with an awareness that speaks to our internal world. It reorients us to the people we love and the people of the world whose lives we may never know. Our emotions expand at this time with compassion for the human condition. With gratitude for the many gifts and privileges that grace our lives, we can hold within our hearts those who are suffering as we extend the compassionate heart beyond the boundaries of the enclosed self. We are being graced with a reprieve from the arduous lunations and planetary cycles of recent months which tapped into our intrinsic wounds. For there is a beautiful trio of fellow travelers who are accompanying this Full Moon; a perfect grand water trine between Venus, Jupiter, and Neptune. Water is emotion. This exquisite trio of fellow travelers are represented as a trinity of love, vision, and transcendance; all serving together as a great perfecter of the healing heart. We have walked through the fire and now find ourselves floating along the oceanic realm of this transcendental current. There is a flow, a dance, a perfect current that carries us to enlightened awareness of our own emotional lives as well as of those we love. We can see, really see. We can feel, really feel. Recent planetary configurations have challenged us with turmoil, both internally and externally. This Full Moon offers hope and vision for a newly discovered emotional life that we have long awaited. The heart is beating like a sacred ceremonious drum. Feel the rhythm of receptivity to the universe’s plans for us. We are walking upon sacred ground as we discover the ethereal realms from which we emanated from; realms too easily forgotten as we journey this earthly domain. Now, we are brilliantly reminded from where we have originated; we can touch it, feel it, taste it. Our feet are a bit above the ground as we embrace the comfort that is upon us; comfort that we can embody and carry with us into the future, when challenges will inevitably arise again. Our natal Moon informs us of our basic emotional and instinctual nature. As the most tender and vulnerable part of us, the Moon reveals the ways in which we need to be nurtured as well as how we nurture others. Thus, by attuning to our individual Moon, we are presented with a wealth of emotional intelligence, self-knowledge, compassion, and understanding. In essence, the Moon is the realm of our soul’s healing. The Moon is the nascent territory of our emotional expedition. During this prolific Full Moon cycle, the Moon’s sign speaks to an enhanced awareness of the next step for our emotional evolution. The manner in which we are being cosmically informed may seem foreign to us, yet it is a necessary layer serving as a specialized lens to bring us into focus for the next leg of our journey. Sagittarius is offering us a bigger picture beyond the petty concerns of the mundane world. An orb of true reflection is cast before us. We must first see before we can feel. We must first feel before we can understand. Self-understanding is the ability to stand under oneself. The Full Moon is always in exact opposition by sign and degree to the Sun. Moon in Sagittarius and Sun in Gemini gaze upon each other with admiration as they unveil the revelation. They are luminary partners in consciousness; strutting the dance of duality in the midst of a vibrant conversation, enticing us to explore our emotional thought forms. The most intellectual and literary duo of the constellation is beckoning us to rewrite our emotional scripts. Sagittarius The Centaur is a mutable masculine fire sign. 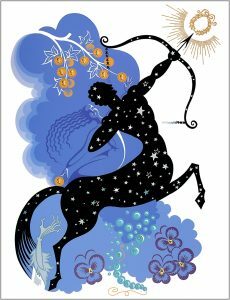 Sagittarius embodies the archetypes of Gypsy, Student and Philosopher. They are the great seekers; high-minded, idealistic and visionary. Sagittarius longs for journey and exploration, both without and within. They will wander to the ends of the earth, to the brink of their psyche, in pursuit of greater meaning. There is tremendous restlessness accompanied by an inherent need for personal freedom. As a fire sign, there is enthusiasm, optimism, and buoyancy. Sagittarius has an inexorable desire for knowledge, persistently seeking to understand the laws of the universe amidst the struggle to be human. The reconciliation of earthly existence and spiritual evolution is deeply Sagittarian. After all, who would know better of this human-spirit duality than one who is half horse and half human? Wherever Sagittarius resides in your natal chart, is a most distinct area of profound truth. Within this very region, there is a deep longing for freedom. At this time, the transiting Full Moon in Sagittarius is expanding the heart throughout many dimensions. As we bask in the highly evolved vibration of this lunation, take heart. It is yours for the taking. Sagittarius Full Moon Blessings Upon You. I loved this about 💕.